It's starting to feel like soup-weather here in LA. Admittedly, I'm not a huge fan of this recent chill in the air but I do love me some soup so when I ran across this recipe a couple weeks ago I put it in queue. My CSA box has been FILLED with zucchini and basil these last few weeks. Garlic, onions and cashews are staple items in the house so I suspect this soup will find a pretty regular spot in the meal rotation. Oh, did I mention how delicious it turned out? So savory! I modified the original recipe a bit by adding the avocado and doubling the cashews which , yes, means more fat so feel free to cut back if that's a concern. Cook onion in olive oil in a large saucepan for about 5 minutes, until softened. Add the garlic and cook for another minute. Stir in the chopped zucchini, salt, and pepper and cook over medium heat, stirring occasionally, for 5 minutes. Add the broth and simmer until zucchini is tender, about 15 minutes. Remove from heat and allow soup to cool for about 30 minute before proceeding. Pour into a blender (in 2 batches, if necessary) taking care to avoid burns by not filling the blender more than halfway. Add the basil, cashews, and avocado. Blend until smooth. Return soup to the pot, season to taste, and keep warm. 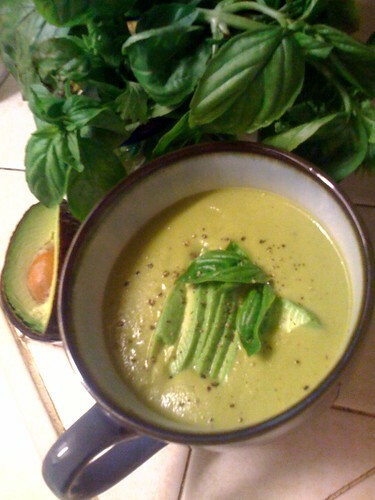 Pour soup into bowls and garnish with avocado slices and a sprig of basil.